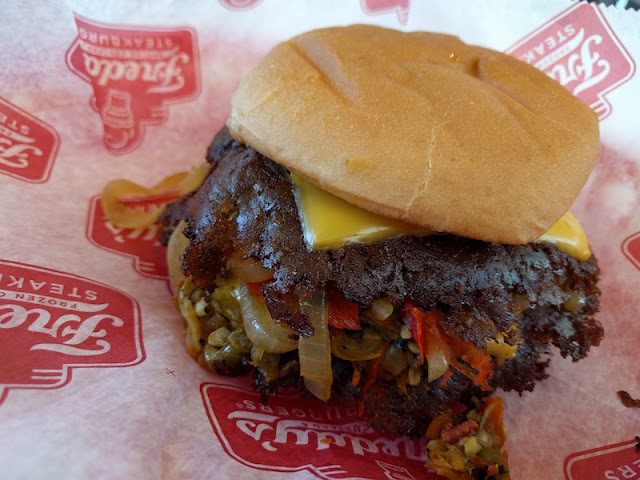 I'm following the Green Chile Cheeseburger trail in New Mexico, and I had to make a stop a Freddy's for a couple of reasons. First off, I've had their green chile cheeseburger before so I already knew it was good, and also I wanted to try the seasonal pumpkin pie concrete. Find out what I think and see more pictures after the jump. 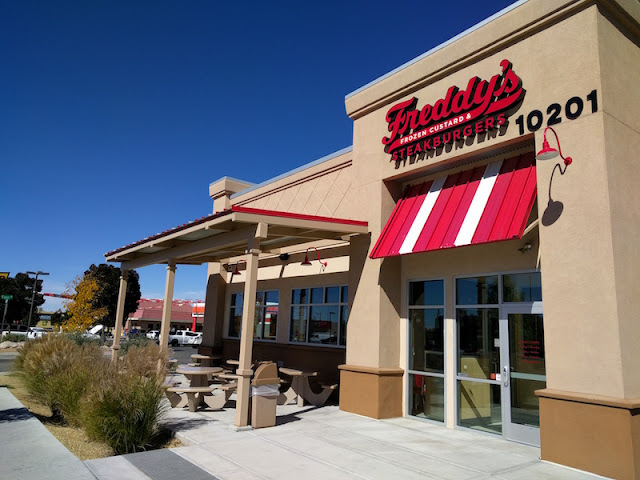 Freddy's Frozen Custard & Steakburgers are in the southwest and midwest, and today I stopped by one their locations in Albuquerque. So how is the pumpkin pie concrete? So what makes it so amazing? 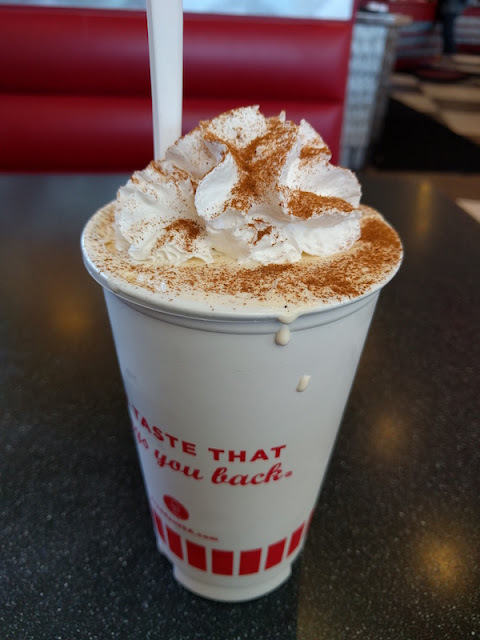 The custard makes it into a thicker drink than a typical shake, which is why Freddy's calls it a concrete. Then there's an actual slice of pumpkin pie that is mixed in. Yep, there are chunks of pie crust in there, too, along with delicious slice of pumpkin pie. It's served only with a spoon, since you can't get the pie chunks through a straw. Don't forget the whipped cream and cinnamon on top. Get one while they are still in season! I've had a Freddy's green chile cheeseburger before, and today's was even better than I remember. Freddy's cooks their burgers to order, so they are always hot and fresh. The hamburger patties are grilled very thin and crispy. And you get two of them, along with Hatch green and autumnal red chiles with grilled onions and two slices of American cheese. And some mustard. This burger is about medium spicy, and very delicious. You know this is the real deal when you see chile seeds in your burger! 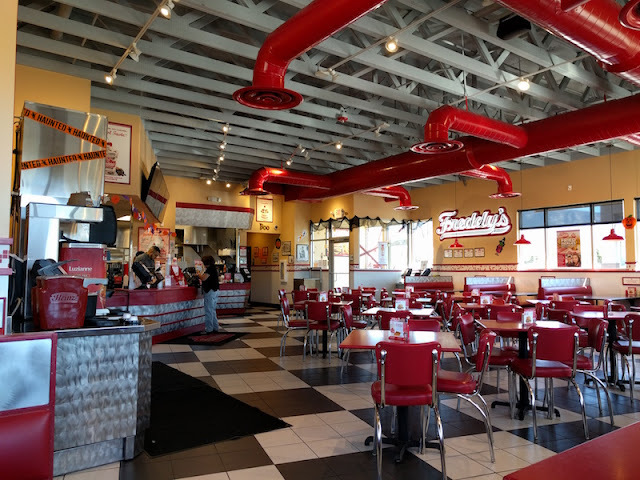 Visit the Freddy's web site to find a location near you.